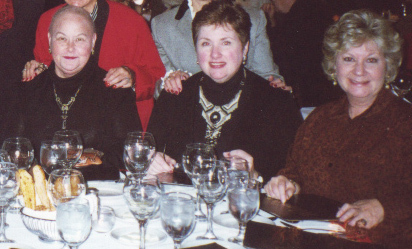 From left to right: Francine, Charlene, and Anne at dinner in Chicago. Francine was a force to be reckoned with. That was true from the first day I met her (in fourth grade), to the last days of her life. When first coming to our elementary school, she was placed in the wrong class. When she was to be transferred to my class, I overheard two older girls say that they were glad, because she was “too cute.” Indeed. She was adorable, with her long corkscrew ponytail and her impish grin. Francine and I became friends, an improbable pairing, given my “goody two shoes” disposition and her “devil may care” bravado. I found her to be fascinating, a little dangerous, and generous to a fault. She could talk me into just about anything; she had that way about her. And we had fun! It was she who first took me to an indoor roller-skating rink (an environment a bit out of my comfort zone, where tough-looking athletic kids wore short shiny skirts, skated backwards, and probably spit on the street); she and her father took me to an incredible horse show at the old Chicago Coliseum (I’d had my picture taken on a pony once, and was familiar with Trigger and Buttermilk from TV, but that was about it); and she urged me to usher with her at a downtown theater (a fabulous experience which I continued to do throughout high school, affording me the opportunity to see many plays at no cost). Francine moved to New York after high school. She was so gutsy! She talked about all the interesting people she’d met and the incredible places she’d gone. It all sounded very glamorous, and I so admired her ability to create a life for herself in a totally new environment. She was Mary Richards before Mary Tyler Moore created the role. However, when we arrived, she handed me an envelope with tickets to a major show. The tickets were for fifth row center, and the writing on the outside indicated that they belonged to Edgar Lansbury, the show’s producer. On that same trip, Francine took us to several iconic New York restaurants, including Toots Shor’s, Reuben’s Delicatessen (the original home of the Reuben sandwich), and Rumplemeyers, a restaurant famous for its ice cream concoctions. At Reuben’s, she insisted that the waiter give us the glass mugs that had contained our drinks. He agreed, and to this day I drink coffee from it every morning. The years went by, and Francine moved back to Chicago. Learning of a vacancy in my building, she rented the apartment. Voicing concern, our friends admonished her to behave herself and not be too intrusive in my life. I was not worried. One night, however, around 11:00 pm, there was a knock on my door. It was Francine, loaded down with various foodstuffs. It seems that she had just watched the Tonight Show, where Vincent Price prepared a recipe called “Pompous Pancakes.” She thought they looked really delicious, so why not make them. Of course she didn’t want to do it alone, so she decided to include me. Despite my protestations, she assembled the ingredients on my counter, including flour, eggs, sugar, peanut butter, jelly, etc. Fortunately I had milk. We made the pancakes, which were excellent, and stuffed our faces at midnight, almost choking from simultaneously eating and laughing. Francine’s move to Fort Wayne afforded our little circle of Chicago friends many years of fun, hilarity, and new experiences. She never failed to entertain. I miss her, but I can still see that impish grin and glint in her eye signaling, “you ain’t seen nothing yet.” And I ain’t. all those she met, were put to her test. don’t even think you could run from her ‘guns’. I never could get ahead of her game. the guilt was too much; I had to go with her flow. Going places I never wanted ‘cause she gave me one of her ‘lookies’. By the time I agreed she made me think I was leading. So many memories were shared at our houses. when I fell on the ice and he helped me up with such quickness. Only admiration and gratitude could you have toward her. kept planning and traveling, nothing she altered. these are some of her qualities we all hold so dear. Let’s give a ‘shout out’ to Francine and her Friends!